OFFICERS have revealed the identity of a man whose death sparked a murder investigation in Fareham. Michael Deary, 29, was found at his flat in Omaha Close on Monday after police attended following a call over concern for welfare at 12.40pm. Officers are now trying to piece together the last few days of Michael's life after his body was discovered with injuries to his back. 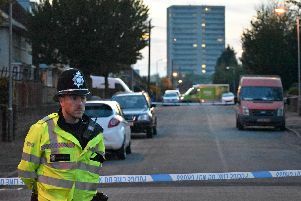 A spokesperson for Hampshire Constabulary said: ‘We have launched a murder investigation in Fareham after Michael’s body was found at his home, a flat, on Omaha Close, Fareham. ‘The last sighting of Michael that has been reported to us was that he left his flat at some point between midday and 1pm on Friday. ‘He was walking towards Redlands Lane with a man and a young woman, who he appeared to know. ‘We want to hear from these two people and from anyone who may have seen Michael return home afterwards. Specialist officers have informed Michael’s family and are providing support to them. Fareham District Commander, Chief Inspector Sharon Woolrich said: ‘Does this photograph of Michael jog your memory? ‘Did you see him on Friday or over the weekend? Even if you saw him earlier in the week this could provide us with further lines of enquiry. Chf Insp Woolrich also addressed worries from residents. She said: ‘I recognise that residents are concerned, and if people need advice or have specific concerns that we can address I’d ask them to speak to uniformed members of the Neighbourhood Policing Team in the area. ‘You can also call 101 or 999 in an emergency or if a crime is in progress. If you want to speak to someone in person you can always visit Fareham Police Station on Quay Street too.